Having been around for 20 years, Glyph (aka Glyphtech) have firmly established themselves as manufacturers of high quality external hard drives. Glyph Hard drives are geared towards audio and video creatives who require rock solid reliability when recording or editing in the studio. Not only are Glyph hard drives reliable but they are also stylish with their sleek, steel and aluminium chassis. When you pick up a Glyph Hard Drive it feels like a serious, robust bit of kit due to its solid industrial build. Anyway that’s enough of an introduction, let’s take a look at some new exciting products which Glyph have just released. 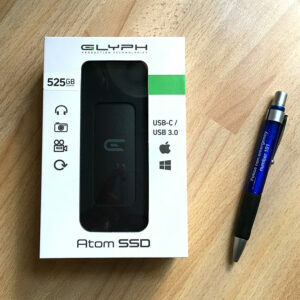 First up is the Glyph Atom SSD. A Mobile Solid State Hard Drive available in the following capacities: 250GB, 525GB, 1TB and 2TB. SSD’s (Solid State Drives) are slowly gaining popularity as they become more affordable. Compared to spinning Hard Disk Drives, SSD’s are a lot more reliable and resilient as they have no spinning disk or moving parts. SSD’s also provide much faster read/write speeds. Typically around 450MB’s compared to about 130MB/s on a standard mobile HDD. The Glyph Atom SSD is fitted with the latest (soon to be universal) USB 3.1 Type-C port. This interface is more popularly known as USB-C and is the same physical connection as Thunderbolt 3. Therefore it’s able to connect to the latest 2017 Mac Book Pro which only has Thunderbolt 3 ports. USB-C is also fully backwards compatible to USB 3.0. Use either the USB-C to USB-C cable when connecting to a 2017 MBP or the USB-C to USB-A cable when connecting to a USB 3.0 or USB 2.0 device. 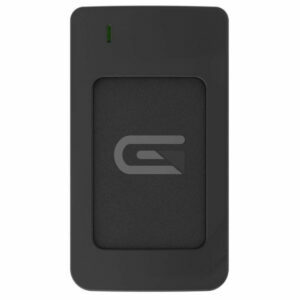 Glyph Atom SSD powers up when connected to the computer via the USB cable – no need for power supply. The small and light weight design mean it’s ideal for use whilst on the move. 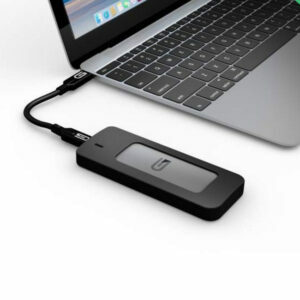 When connected to a Thunderbolt3/USB-C or USB 3.0 device the Atom SSD will provide super fast transfer speeds around 450-480MB/s. Ideal for working with video and multi-track audio in a DAW. If you require a super fast external hard drive for audio or video editing whilst travelling or working in the field, the Atom SSD ticks that box. The Atom SSD is one of the smallest external SSD’s on the market. Smaller than the G-Technology G-Drive SSD and LaCie Rugged SSD but larger than the tiny Samsung T3 or Angelbird SSD2go. As you can probably tell, we highly recommend the Glyph Atom SSD. Available to order form our online store. 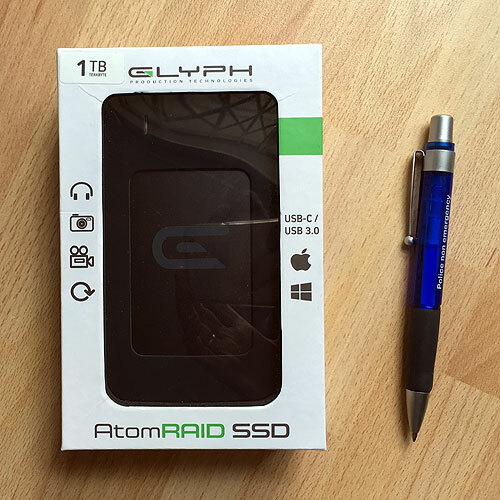 If you require extremely fast read/write speeds then you should opt for the faster Glyph Atom RAID SSD which can provide transfer speeds up to 800MB/s! This is one of the fastest mobile hard drives on the market. This would be ideal for streaming a high res’ sample library, editing HD video on the move or using as a project drive with a multi-track DAW setup where drive performance is critical. Available in 1TB and 2TB capacities, the Atom RAID contains 2x M2 Solid State Hard Drives configured in RAID 0. In RAID 0 both SSD drives appear as one volume. The data is striped across both disks providing much higher data throughput compared to a single disk. The Glyph Atom RAID is fixed in RAID 0 so is not configurable in other RAID modes. Geared towards super fast speed not data redundancy. Like the Atom SSD, the Atom RAID has a single USB-C interface so is compatible with Thunderbolt 3 and USB 3.0. No mains power is required. The unit is larger than the Atom (as it contains two disks) but is still fairly small and can be classed as a pocket drive with dimensions of: 69 x 122 x 15 mm (WxHxD). Of course, this high speed comes at an extra cost. If you feel you do need that extra speed and don’t mind paying a little extra then go for the Atom RAID. If small size is key, the single disk Atom SSD will provide enough speed for most demanding applications and has a cheaper price tag. Available to buy from our online store.